Air India, the state-owned carrier of India, marked this year’s International Women’s Day by flying all-women-crews to various cities – Washington DC, Newark, Chicago & San Francisco. The national carrier flew four flights to the US with women pilots as its commanders. Supporting the initiative, the Indian Consulate in New York honored the eight pilots. “Literally with high flying women. All 4 Air India flights into US today, JFK, Newark, Chicago & SFo were commandered by women pilots. 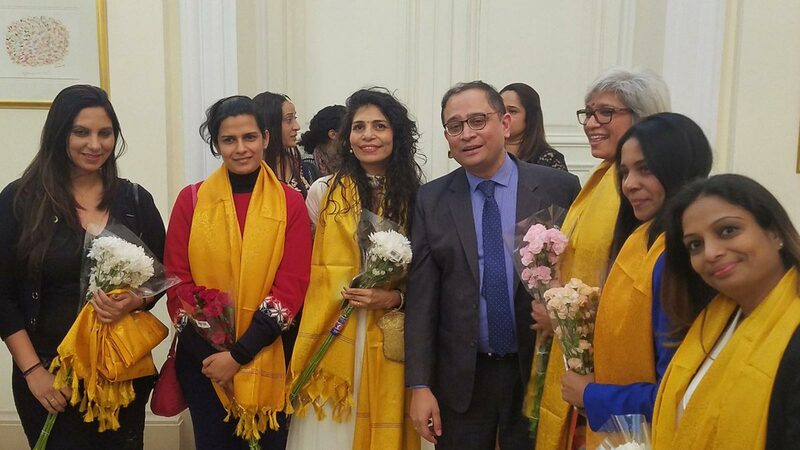 We were delighted to honour 8 women pilots at the Consulate on #Internationalwomensday .Big thanks to Vandana Sharma of @airindiain & FIA,” tweeted Consul General of India, New York, Sandeep Chakravorty. In addition to the four flights to the US, the airline flew all-women-crew flights to destinations including Milan, Frankfurt, and Singapore. “The national carrier has planned several flights on its domestic and international sectors operated only by its women employees to salute woman power,” the airliner had said last week in a press release. It had announced that the all-women-crew flights that the company intends to operate to celebrate this year’s International Women’s Day will have women pilots in addition to women cabin crew, check-in staff, doctor, commercial staff, ground operators to technicians, engineers, flight dispatchers and even safety and quality auditors. Air India reiterated that by flying all-women-crew in its flights it wants to stress on its constant efforts to encourage women by giving them an equal opportunity in the workplace. The schedule for the crews was also planned by a woman – Amrita Sharan, Executive Director Integration and Industrial Relations and in charge of Crew Management, announced the carrier.